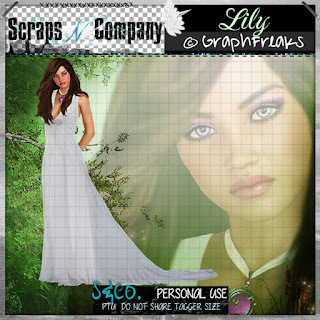 Lily is a gorgeously elegant Maiden by GraphFreaks. She will grace all of your designing needs whether they be Fantasy themed, elegant or more. Character separate from background- Full size and Close up. Exclusive to ScrapsNCompany and you can find her HERE. There is also a matching kit available for Lily HERE. I used a different scrap kit, which you can do as well. I used “Enchanted Meadow” by Disturbed Scraps that is also a match to a separated tube of the same name also by GraphFreaks. You can get that kit HERE.